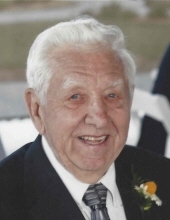 Harold Boe, 88, of Ottawa, died on Monday afternoon at his home surrounded by his family. Funeral Services will be at 11 a.m. on Saturday, February 2, at Bethel Lutheran Brethren Church with the Rev. Edward Strom, officiating. Burial will be in Oakwood Memorial Park in Ottawa. Pallbearers will be his grandsons. Visitation will be from 3 to 7 p.m. on Friday, February 1 at the Mueller Funeral Home in Ottawa and also 1 hour prior to the funeral service at the church. Harold was born on January 8, 1931, in Ottawa to Tyler and Margaret (Osthus) Boe. He was a 1948 graduate of Ottawa Township High School. He married Josephine “Jody” Anderson on July 6, 1952 in Ottawa and together raised 6 children. Harold was employed at Libbey-Owens-Ford until his retirement in 1989. He enjoyed farming over a 20 year span in Wallace Twp. Harold was an avid collector. He loved his antiques and the history behind them. He loved his family, his Norwegian heritage and was proud to be called “Papa Boe”. Harold enjoyed people and never met a stranger. He was a member of the LaSalle County Farm Bureau, Missouri Valley Wrench Club, Corn Collectors Assoc. & Hay Tool Collectors Assoc. He is survived by 5 children, Gary (Patty) Boe of Ottawa, Glenda (Roger) Krug, of Ottawa, Joetta (Bob) Kistenfeger, of Mt. Zion, Karen (Don) Boyer, of Washington, and Kent Boe of Marseilles; 14 grandchildren: Blake and Aaron Boe, Jeremy Krug, Callie Riveland, Molly Anderson, Mallary Krug, Zachary, Ryan, and Jayson Kistenfeger, Samantha Buckner, Rocky Boyer, Stephany Wieland, Tiffany and Austin Boe and 19 great-grandchildren, 4 siblings, John Boe and Marjorie Boe, both of Ottawa, Bernard (Lois) Boe, of Sheridan, and Archie (Pat) Boe, of Ottawa. He was preceded in death by his wife on Feb. 29, 1996, one daughter Debbie Boe and one great-grandson Brayden Anderson. Memorials may be made to the American Heart Association, Hospice or to the donor’s choice. To send flowers or a remembrance gift to the family of Harold Boe, please visit our Tribute Store. "Email Address" would like to share the life celebration of Harold Boe. Click on the "link" to go to share a favorite memory or leave a condolence message for the family.